No, this isn't a newsflash--Trump's still there. 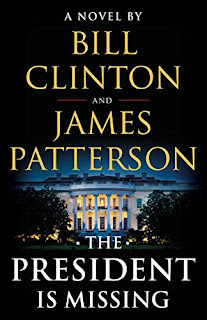 This is just a quick review, of sorts, of the recent novel by James Patterson and Bill Clinton, called The President Is Missing. By the way, never doubt the power of name recognition: I probably would never have bought and read this book otherwise. Surprisingly, though, I enjoyed it. If you're willing to overlook the (expected) moralizing, I think you might find it to be an interesting--and sometimes thrilling--thriller. 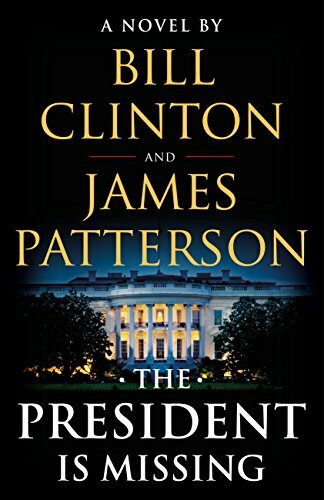 It has all the suspense of a typical Patterson novel, plus some insider facts about the White House, congressional dealings, and the Secret Service that I suspect came from the former President. A confession, here: I like Bill Clinton, despite his faults, and I truly like James Patterson (he once said kind things about one of my stories, so he'll always be a saint, in my view)--and I'm sure my fascination with the co-authors helped me like this book. But I honestly do feel that there's plenty to enjoy about it, for almost anyone who likes a fast-moving, hi-tech, plot-twisty novel. I won't give anything away here, but there's plenty of conflict, both external and internal. The plot includes gunfights, professional assassins, political posturing and turf battles, right vs. wrong soulsearching, and cyberterrorism galore. POTUS even has a rare blood disorder that threatens to kill him before the bad guys do. And--since you might be wondering--yes, there's a mystery featured in the plot: one of the Prez's inner circle at the White House is a traitor whose identity is revealed only at the very end. Part of my reason for reading this was curiosity, and for Patterson fans, there are plenty of hints that he's steering the ship. Most of the chapters are short, many of them no more than two pages, and there's nonstop action with a lot of plot reversals throughout. The only real drawback I found to this novel was the fact that the entire final chapter was a preachy speech about what makes America great. Overall, though, I liked the book and would recommend it. Even at 500 pages, it's a fast and entertaining read. How about you guys? Anybody else read this novel yet? If so, what are your thoughts? Are you Patterson fans, or not? Did you think this was up to his usual standards? The President Is Missing is available everywhere, I suppose, and can be found on Amazon here. Now I'm waiting for the novel by Trump and Putin . . .
John, it sounds better than I thought it would. It also sounds a little like the movie Air Force One with Harrison Ford, but on the ground. Point of interest: When Clinton was President and I was on the board of the LA chapter of Sisters in Crime, the chapter came out with an anthology. Knowing he liked mysteries I sent it to him. I didn't get a personal response but did get a response from the White House, which was very cool. Still have it. Haven't read it yet, but will get a hold of it soon. Paul, it's really not bad. And yes, I thought about Air Force One when I was reading this. Both that movie and this book feature an action-hero president. Eve, I'll let you know when I get hold of the Trump/Putin collaboration. I wish he was missing. Just sayin'. Know a guy who writes with Patterson. P still has strong hold on the book. My friend writes a chapter, and then P revises it. The original plot is Patterson's, so it definitely is writer-for-hire. Pretty sure I couldn't do that sort of writing. I need to be really invested in the whole thing, and that means absolutely loving the plot and main character I came up with. I know a writer who co-authors with Patterson too, Melodie--might be the same one--and he seems to enjoy it. Definitely an honor to be chosen for that, and the pay's good as well. But I agree, I think that kind of work-for-hire would be hard to do. 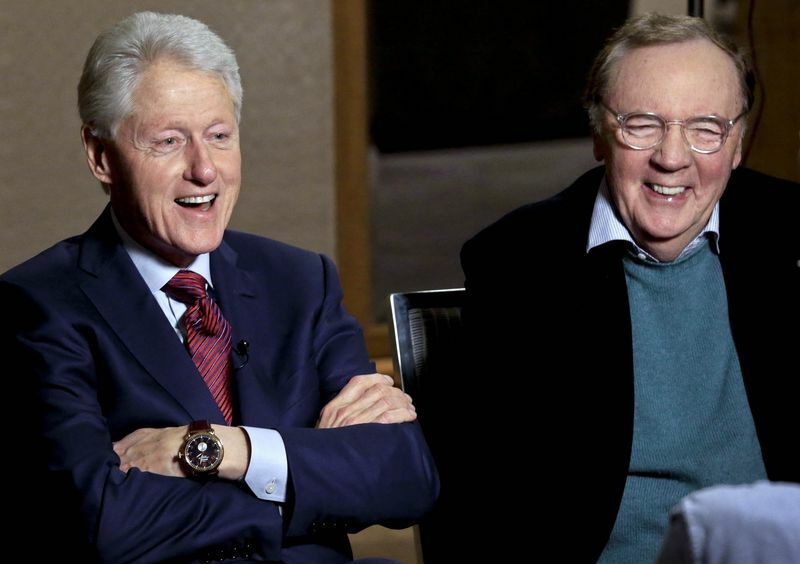 I suspect that both Clinton and Patterson had a lot of fun with this project. A book by Putin & Drumpf would, I hope, be written mostly by Putin. I know books have been co-written and ghost written for years, maybe centuries, but I don't think I could work that way. I used to love collaborating with designers when I directed in theater, but that's a different thing. I know what my voice sounds like, and if someone started changing it, it would probably make me even crazier than I already am. That said, I'll probably read the book eventually. I just have too many other books on my TBR list to worry about that one yet. I know what you mean, Steve, and I agree about collaboration. (I once heard it's twice the work for half the pay.) I've collaborated on a story only once, with Andy McAleer, and we had a great time, but it got a superquick rejection the first shot out of the box, and we never tried it anyplace else. I think collaborating all the time, like Preston and Child for example, would be really hard. As for reading The President Is Missing, I did it mostly just out of curiosity. I've never collaborated with anyone, and have no plans to. Writing for me is a very private experience. It is, Eve--I agree. The only way Andy and I were able to do it was that he wrote the beginning of a story and I wrote the ending. I believe I heard that one of the novels Stephen King and Peter Straub wrote together (The Talisman, I think) was done as follows: King wrote a chapter, then Straub wrote one, then King wrote one, and so on. Boy that'd be hard. Mike, I too almost waited for the paperback. As for the Donald . . . have you been talking to Liz?? Are you familiar with THE PRESIDENT VANISHES? A novel published anonymously in 1934. The author turned out to be Rex Stout. (He wrote it between the time the first Nero Wolfe novel was written and its publication date.) I read it many decades ago and it was very much a tale of the 1930s. Interesting, Rob--thanks for that. I'm not familiar with The President Vanishes, though I've read a lot of Rex Stout. I love trivia like that. He didn't co-author it with Franklin D. Roosevelt, did he?? You're mixing up two books from a few years apart. Rex Stout's The President Vanishes was one of that gentleman's very early works, long before his fame. The President's Mystery Plot was based on a notion that FDR put before a group of popular mystery writers of that time (including S.S. Van Dine, Anthony Abbot, and some others you may not readily recall). There was even a movie made (simply called The President's Mystery), but none of the involved writers managed to come up with a solution. Finally, in 1967, Erle Stanley Gardner was engaged to "solve" the mystery, for which task he brought in Perry Mason; the resultant book had some limited success (this was a year after the Perry Mason TV series went off the air). I learn something new every day, Mike. Thanks for the info!